We are thrilled to share how God has been working in our lives. We never would have imagined when we met at church as 9 year olds in the fourth grade, that 20+ years later we'd be married to each other (after being high school sweethearts), live in the house that Julia grew up in, be raising 4 precious children...and adopting our fifth child. Although adoption has been on our hearts for a long time, God used the medical needs of our third child to direct our hearts and path towards special needs adoption. Our adoption dream came true last year when we adopted our fourth child, Drew. We have always hoped that it would be God's plan for us to adopt more than once. 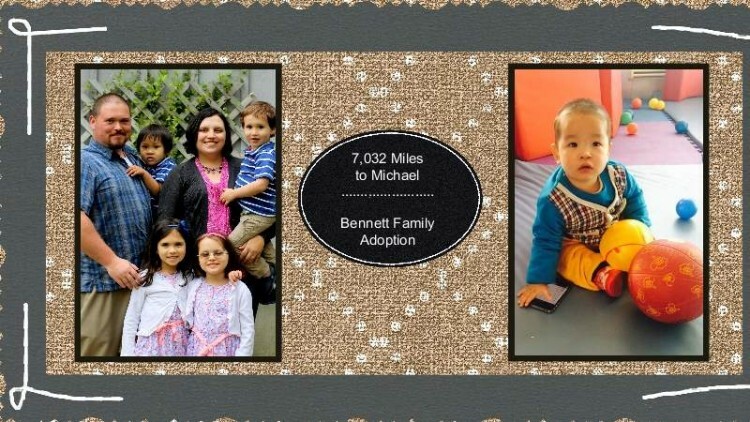 In March, we learned about Michael, a two year old boy with special needs who is living in an orphanage in Asia. After much prayer and consideration, we began the process to adopt Michael as our son. We hope to travel in about 10-12 months to finalize his adoption and bring him home. The biggest challenge is not opening our hearts to another child, but it is finding the finances to cover the adoption expenses. The estimated total cost for the adoption is $30,000-$35,000. Our adoption expenses include agency fees, home study, background checks, visas, fingerprinting, travel expenses, orphanage fee, and post placement fees, etc. It would mean so much to us if you would pray for us and Michael as we walk this journey of adoption. We hope that this adoption story reminds us and others of what God has done for us in Christ...that as Christians, we are adopted by our Heavenly Father. 1. Please pray that God would continue to tenderly care for Michael through his caregivers until we are able to bring him home; that God would prepare Alyssa, Brooke, Josiah and Drew for the upcoming changes to our family; and that God will give us wisdom and discernment as we seek to be godly parents and glorify God in all that we do. 2. If you feel led to help by donating to help us cover some of Michael's adoption expenses, you can make a tax deductible contribution through this site. Lifting your family up in prayer. May God bless you today and always. We're excited to meet Michael and praying for y'all throughout the process! Isaiah In Our Hearts Help Lenox!